Created for active use by fortune-tellers, this manual is remarkably pristine and a rare example of the form, in part because it was never completed. 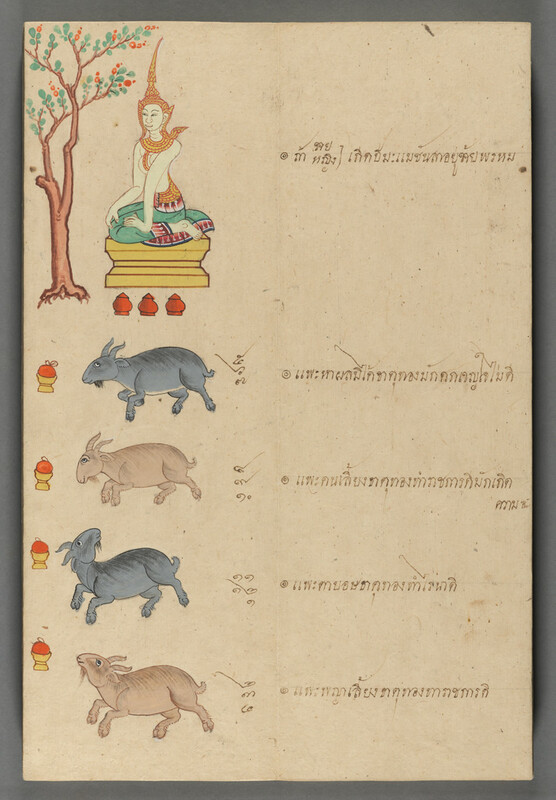 All twelve animals of the Thai zodiac are depicted in it, but identifying and instructional text for each of the four variant animals, — like that provided for the hungry (literally: “unable to find fruit” แพะหาผลมิได้ ธาตุทอง มักตกเข็ญใจ ไม่ด), domestic, blind, and royal goats —, ends with the monkey year. Though as a monkey myself, I’ve always found this disappointing, the opportunity to see such a manuscript almost as freshly beautiful as the day it was made is stunning.